A very important meeting about the future of Ballynonty AC will be held in the Ballynonty Community House at 7pm on Tuesday the 19th of March 2019. All members and interested parties are asked to attend. Thanks to all the runners that turned out for this years Ballynonty 10 mile road race on what turned out to be a very wet day. Thanks to everyone who turned out for this years Ballynonty 10 mile road race which was held on Sunday the 30th of July 2017. This year the race was named in memory of Sean Healy who was involved in the running of the club for over 50 years. We had a total of 81 finishers this year which is up 5% on last year. It is with great regret that the club learned of the death of Sean Healy of Mill Road, Ballynonty on Sunday the 22nd of January 2017. Sean was involved in the running of Ballynonty Athletic Club for over 50 years. Seán competed in the inaugural Dublin Marathon in 1980 at the age of fifty. He would subsequently make 21 consecutive appearances in Dublin, as well as competing twice in the London Marathon. His love for Ballynonty never waned and he helped reform the Club once again in 1993, where it still remains to this day. Under his guidance, many adult and juvenile County, Provincial and AllIreland titles have been won. He managed teams to win 2001 National Marathon bronze medals in Dungarvan, in 2002 Munster Intermediate Cross-Country gold medals and National Intermediate bronze medals in Killybegs, and in 2003 Munster Novice and County Senior Cross Country titles. Seán also has served on the County Board as a Secretary and Assistant Treasurer. But it is his drive and belief in his Club athletes that is his hallmark, something that remains undiminished at his elder age. His receipt of the Patsy O’Connor Memorial Award from the Munster Council is a just reward for all his effort down through the years. 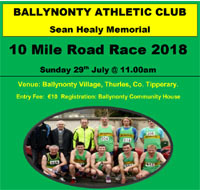 A new page for the various records for the Ballynonty 10 mile road race has now been added to the website. On that page, you’ll find all the details about the course records, a list of all the previous winners as well as the times for the top ten men and women over the last 10 years. All the results for the Ballynonty 10 from 2007 to 1016 are now on the site as well. Just put your cursor over the 10 mile tab near the top of the page and select the year. At present, we have only partial records of the results for the 2007 race. If you any additional information, please let us know.